Hakusan, Japan, November 14, 2012 – Eizo Nanao Corporation (TSE: 6737) today announced the FlexScan S1703, a 17-inch square (5:4 aspect ratio) LED-backlit monitor for corporate and small offices that consumes just 9 watts of power during typical operation and 0.5 watts in power save mode. The FlexScan S1703 is also easy on the eyes. It comes with an ambient brightness sensor called Auto EcoView and a preset mode called Paper mode that lower the monitor’s brightness and color temperature respectively to reduce the blue light output which is known to cause eye fatigue. In addition to Paper mode, the FlexScan S1703 also comes with EyeCare, Text, sRGB, and Custom (user-defined settings) modes. EyeCare mode lowers brightness to a mere 3 cd/m2 to help reduce eye fatigue in work environments with little or no ambient lighting. The user can toggle between modes manually in the OSD menu or automatically by using the bundled ScreenManager Pro for LCD software (Windows 8, 7 and Vista compatible1) to assign a mode to each application. The FlexScan S1703 has a 1280 x 1024 native resolution. It uses a twisted nematic (TN) panel with 250 cd/m2 brightness, 1000:1 contrast ratio, and 170° vertical and 160° horizontal viewing angles. The FlexScan S1703 comes with a five-year warranty2. This is two years longer than the three-year warranty of most monitor for a low total cost of ownership. One DVI-D (digital) and one D-Sub (analog) input. Available without a stand for customers with their own VESA-compatible mounting solutions. 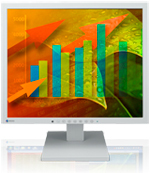 EcoView Index that displays power and CO2 savings that result from using the monitor’s ambient brightness sensor. Compatibility with EIZO EcoView NET management software which gives administrators centralized control over the power settings of all FlexScan monitors on a network. EPEAT Gold, Energy Star 6.0, and TCO Certified Displays 6.0 compliance. The FlexScan S1703 is now shipping. Date of availability varies so please contact the EIZO subsidiary or distributor in your country for details. 1Windows 8 compatibility planned for December 2012. 2The usage time is limited to 30,000 hours from the date of purchase. All product names are trademarks or registered trademarks of their respective companies. EIZO and FlexScan are registered trademarks of Eizo Nanao Corporation.